I love party food. Whether I am entertaining or going to a party, one of my first thoughts is of the food. The dishes prepared for parties are so special. They are either favorites from tried and true recipes or new discoveries to share. Parties are such good food adventures and everyone makes their very best. I had tapenade for the first time at a party. It was not long after I started liking olives. Something changed with my taste buds about the time I turned 40. Before then, I did not like olives, eat much seafood, drink red wine, or enjoy many foods I do now. Since then, I try everything again I did not like before. The experience of food re-discovery has been a great one. Making tapenade was on my agenda soon after I tasted it. I had to find a good recipe. The search was on. What I found is tapenade can be as simple as finely chopped olives with olive oil to being made in a processor with many ingredients. After looking through dozens of recipes and seeing what all could go into tapenade, I could not find one with everything I wanted in it. I used a bit of different recipes to make my own. It is a combination of base recipes from Alton Brown and Emeril Lagasse plus some ingredients I was inspired to add from other recipes in my search. 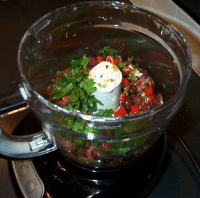 Preparing tapenade is easy with a food processor. All you have to do is put everything in the processor bowl fitted with a knife blade and process. So quick! I could not imagine hand chopping or grinding with a mortar and pestle. However, if you do not have a food processor, chop or grind the ingredients as fine as you can. I serve it with crostini (as pictured above). It can also be used as a topping for seafood or in sandwiches. Try it in an omelette or on a salad. Yum! This is a great recipe for your next party. Greek Olive Tapenade on top of a crostini is tasty finger food. It goes great with wine. A real crowd pleaser. Enjoy! Put all ingredients in the bowl of a food processor fitted with a knife blade. Process to combine until it becomes a coarse paste, stopping to scrape down bowl as needed. It should only take a minute or two. Transfer to a bowl and serve. Refrigerate leftovers. Makes about 2 cups. Note: Although you can serve it immediately, I will make the tapenade a couple of days ahead. The flavor gets better after sitting in the fridge. Take it out of the refrigerator about an hour before serving to bring to room temperature.